The Making of AbbyShot’s Originals! Three original products hit the new site during the launch week, creating a lot of curiosity and excitement. What better way to dig deeper into these originals than to talk to Aimee, the designer herself! Q: This beautiful ladies’ coat is getting some amazing reactions from site visitors. What inspired you to create this design? A: Well, I keep up on the latest trends in the fashion world, and raglan coats for women are becoming more and more popular. I really enjoy high collars too, so I combined all this into a design that I would like to wear! 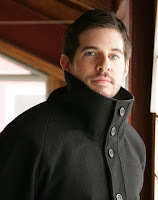 Q: One customer told us that this new design reminded him of Peter Petrelli’s coat from the TV show “Heroes”. Was this a part of the origin of this coat? A: Actually, the origin had nothing to do with that (although it is cool!). We had a local customer come to us who wanted something different and custom-made. He really admired our “Mobil Ave” but wanted something that fitted more closely around the neck and could handle the extreme weather we have here! So the Informer was born. Q: This garment is significantly different from the rest of the AbbyShot catalogue. What were you trying to achieve with this design? A: I feel this coat reaches out to a very wide audience. 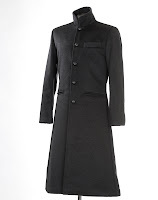 It is a peacoat inspired design but we made it our own. The collar is very distinctive and we added a touch of leather there as well to make it very rich and comfortable to wear. Q: A lot of people are wondering: are there any more Abby Originals in the works? A: Yes! There are definitely more “Coming Attractions” because I love the creative brain power involved in making these original garments. I can’t give too much away, but expect more cool originals in the future!